Exposure Lights has announced that Crewsaver will be distributing their range of highly powerful, LED marine search lights and safety aids in the UK and Ireland. The agreement will cover retail sales outlets in the yachting, dinghy and paddle markets. Dongfeng Race Team became the first Chinese-flagged campaign to win the Volvo Ocean Race today when it took the title after winning a tense and exciting final leg from Gothenburg in Sweden to The Hague in The Netherlands. 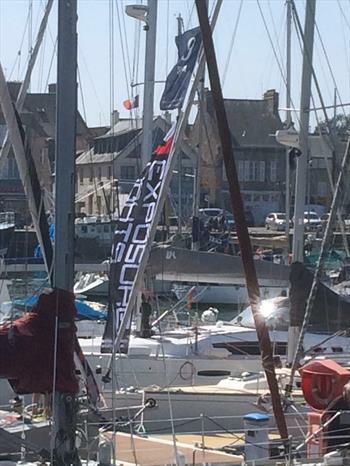 Many thanks to Exposure Lights for sponsoring their first race with JOG and for providing excellent prizes for the après-sail party in the delightful port of St Vaast on Saturday 5th May. While the draw of the seafood restaurants and the traditional Saturday JOG party were perhaps instrumental in attracting over 40 entrants, first the fleet had to get there and through the lock gate before closing time. Exposure Lights are proud to announce their sponsorship of the Junior Offshore Group (JOG) St Vaast Race. The race, which will be named the Exposure Lights JOG St Vaast Race, is a popular one normally attracting around 45 boats, and finishing with a relaxed competitors party in the beautiful French finishing port. Exposure Lights are supporting the SORC solo offshore sailors with their safety and night vision for the 2018 season and the SORC Round the Rock Race.